While we were poking around shops on Main Street in Fort Bragg, a shopkeeper told us about B Bryan Preserve, an African mammal preserve breeding, raising, and caring for the Grevy’s Zebra, Hartmann’s Mountain Zebra, Greater Kudu, Sale and Roan Antelope, and Rothschild Giraffe. An African animal preserve near Fort Bragg? Holy Moly! We checked out the website and made reservations that night for the very next day. Our reservations weren’t until 4:30 in the afternoon, so we spent the day exploring sites on the way, including Greenwood State Beach, Manchester State Beach Park, the Point Arena Pier at Arena Cove, the Point Arena Lighthouse, and Moat Creek Beach. Moat Creek Beach, officially called Moat Creek Coastal Access, covers three miles of beautiful beach, bluffs, and two creeks that flow into the ocean — Moat Creek and Ross Creek. Located a little more than two miles south of Point Arena, the Moat Creek Public Access Area is owned by the State Coastal Conservancy and is operated in partnership with the Moat Creek Managing Agency (MCMA). It includes a small parking lot, a rocky sand beach, and a scenic half-mile loop trail along the coastal bluff between Moat and Ross Creeks, which is also part of the California Coastal Trail. Driftwood covered Moat Creek Beach is also called Whiskey Shoals. It is a popular Northern California destination for surfing, tidepooling, abalone diving, scuba diving, and kayaking. An easy trail takes you from the parking area to the narrow beach where Moat Creek empties into the Pacific Ocean. 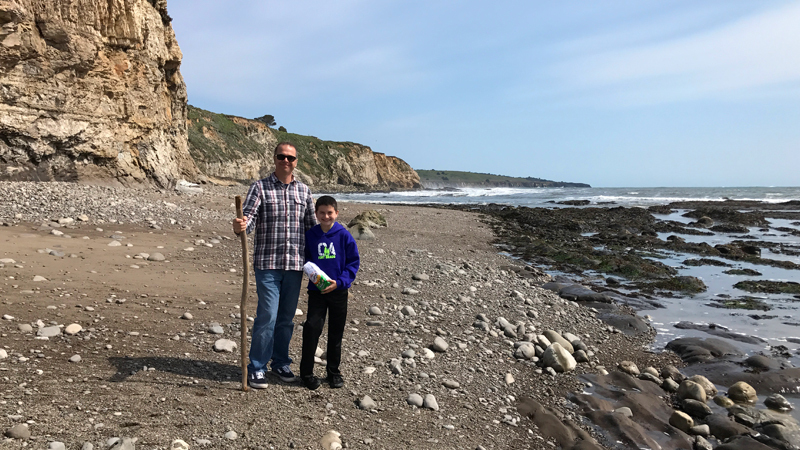 We were lucky enough to arrive at Moat Creek Beach between tides, so we were able to explore the beach along the bottoms of the cliffs, searching for sea shells and collecting cool rocks. What made our visit even better was that ee were the only people at the beach, which made it wonderfully quiet and serene. Moat Creek Beach, in the Whiskey Shoals area, is located just north of Bowling Ball Beach at 27101 Shoreline Highway, Point Arena, California 95468 in Mendocino County. Moat Creek Coastal Access provides a trail to Moat Creek Beach and the 1.2 mile Moat Creek to Ross Creek Loop Trail atop the bluffs. The trail between Moat and Ross Creeks is a segment of the California Coastal Trail. Access is free and there is a small parking lot for about 15 vehicles. A single restroom is available at the parking area. Moat Creek Beach is a popular spot for surfing, whale watching, hiking, kayaking, bird watching, abalone diving, and at low tide, tide pooling.